Fresh off the heels of Rihanna's irritatingly stunning shoot for Vogue Brazil, another island girl, the actually super supermodel, Joan Smalls (she's from Puerto Rico) is starring in another international edition Vogue shoot. In the May issue of Vogue Italia, Joan appears in molten metallics effortlessly lolling off on some rocky terrain. It always shocks me how models can make this mess look so easy! If any normal person were to attempt this shoot, a scorpion would crawl out dem rocks very normal and bite them up, then they would roll off and bounce down the jagged rocks into the depths below...or something. Some of these pics, shot by Sølve Sundsbø, actually defy gravity! Some things are best left to the professionals. In general Vogue Italia is lauded for it's inclusion of black models and it's attempts at creating more diversity in their editorial pages, but every so often their efforts can go horribly wrong. This is not one of them. 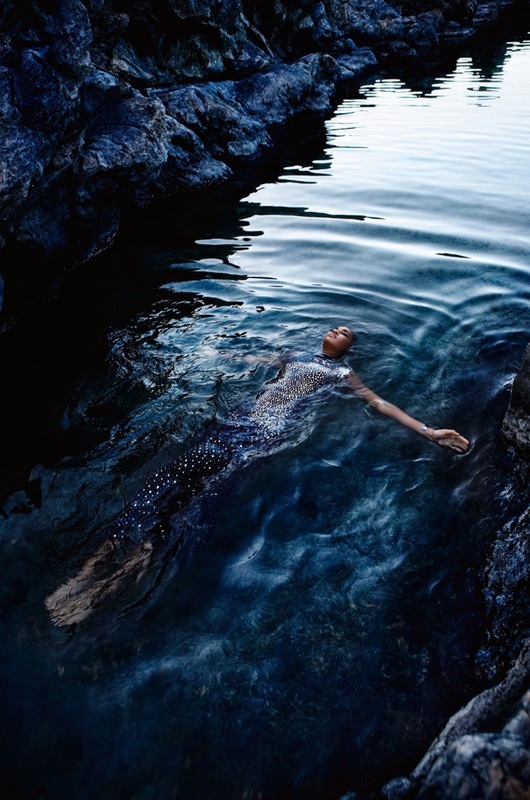 Just a few months ago a team from Vogue Italia journeyed to Trinidad's shores ostensibly to look for shoot locations, models and designers. The government put on a big (and unnecessary) show for the stylists who did end up shooting here, so I can't wait to see the results (and if they did end up including any of our local designers). If you have a good eye, you'll realize that in one of the shots she's smoldering in the same metallic Gucci frock that RiRi smolders in on the cover of the Brazilian edition. UPDATED: This post has been edited to reflect that Joan is actually from Puerto Rico and not the Dominican Republic as I originally wrote. I imagine this must be a mistake as egregious as asking a Trini if they from Jamaica.